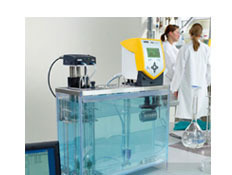 S V Instruments offers a comprehensive range in viscosity analysis. Be it a viscometer needed in your laboratory or online measurement of viscosity of your product in the process line. You want to measure viscosity index of oils or want to measure relative viscosity of your polymer we have a solution for you. You may need viscometer for a couple of sample a day or more than 100 samples a day we can offer you the correct configuration for your need. 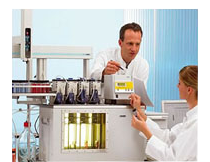 We offer viscometer for complex samples like Bitumen or Chocolate also. So just let us know your requirement and we will provide you the solution. And we offer instruments which never compromise with the quality of measurement. Glass capillary viscometers are available in various designs, which differ with respect to application area, accuracy and operation. As of now, they can be supplied by LAUDA in the Ubbelohde, Cannon-Fenske, Micro-Ostwald and special designs. 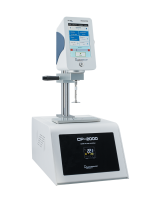 For high-precision, automatic measuring, the Ubbelohde version with the suspended level is used by preference, among other reasons because the flow time is independent of the precise sample volume. To keep the measuring times within the optimum range between approx. 60 and 600 s, different capillary diameters are supplied to cover the complete viscosity range. 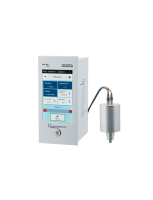 The procedure, particularly with automatic LAUDA measuring technology and precise temperature control using LAUDA clear-view thermostats, is unrivalled in terms of accuracy for measuring liquids with nearly Newtonian (ideal) flow properties. The new LAUDA iVisc is a capillary viscometer for the automatic measurement and evaluation of kinematic viscosity in accordance with DIN 51562 and ASTM D445. Furthermore, it opens up the possibility of calculating polymer data, e.g. SV-, IV- and K-values and the dynamic viscosities of oils, lubricants and beverages. 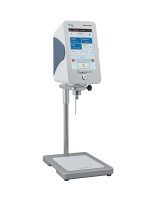 The iVisc can be employed in any test laboratory where viscosity values have to be determined. Other wide-ranging application examples can be found in quality control in polymer manufacture, in compounding and in the manufacture of plastic prefabricated parts. With the modular concept of the Processor viscosity measuring system PVS 1, measuring routines can be performed efficiently, quickly, safely, and with good reproducibility. 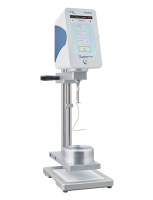 It enables the automatic determination of kinematic viscosities using standardised capillary viscometers and an optimum adaptation to the requirements of the application with respect to sample through put and automation. This unique modular system allows individual configuration of measuring systems, from one to four to even eight measuring stands, with automatic cleaning or automatic sample generator. We present four design examples below. Determination of relative, reduced and intrinsic viscosities as a measure of the mean molecular weight and thus the length of the polymers, which is decisive for quality. Determination of the viscosity including its temperature dependence and the viscosity index according to ASTM and ISO standards. Determination of the reaction activity. Determination of the chain length of base materials for technical papers and textiles or the change in the polymer length over various processing steps and through wear. The B-One TOUCH has a 7" touch screen and comes with a stylus. This easy-to-use screen lets you see all measurement parameters at the same time. BENEFITS FOR YOU: The B-ONE TOUCH lets you set measuring times for thixotropic products. Kinematic viscosity when your product's density is inputted. 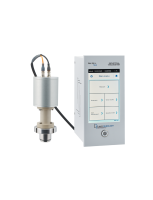 Designed to directly control viscosity in process tanks or manufacturing workshops without needing to be plugged in, the Portable B-One Touch guarantees over an hour of measuring time with spindles adapted to your products. SECURITY AND CONFIDENTIALITY: An "operator" function allows you to enter a username for you instrument. This user must then be identified using a 4-digit code. There is also a protected mode that locks your measurement conditions. BENEFITS FOR YOU: The Portable B-ONE TOUCH gives you with an hour of measuring time. Set measuring times for your thixotropic products. Get kinematic viscosity by inputting the density of your product. For your ultra-sensitive measurements, the First Touch features a torque range of 0.005 to 0.8 mNm. With this innovation you can take advantage of this resolution without the burdens of using spring technology. TEMPERATURE: The FIRST TOUCH has a PT100 sensor which indicates temperatures between -50 °C to + 300 °C. VISCOSITY RANGE: 3 - 180,000,000 mPa·s depending on the measuring geometry used. BENEFITS FOR YOU: You can connect a USB printer. External control thanks to the optional VISCO RM software. The FIRST TOUCH lets you set measuring times for thixotropic products. Get kinematic viscosity by inputting the density of your product. TEMPERATURE: The RM 100 TOUCH has a PT100 sensor which indicates temperatures between -50 °C to + 300 °C. BENEFITS FOR YOU: Connect your RM 100 TOUCH to our temperature control systems (i.e. : EVA MS-R or DIN – PAGES 46 to 51). Memorise your measurement protocols directly on your viscometer. The RM 100 TOUCH lets you set measuring times for thixotropic products. You can connect a USB printer. External control thanks to the optional VISCO RM software. TEMPERATURE: The Portable RM 100 TOUCH has a PT100 sensor which indicates temperatures between -50 °C to + 300 °C. BENEFITS FOR YOU: The Portable RM 100 TOUCH gives you with an hour of measuring time. Save your measurement protocols directly on your viscometer. 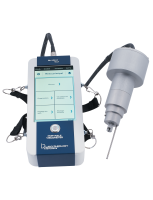 The Portable RM 100 TOUCH lets you set measuring times for thixotropic products. You can connect a USB printer. External control thanks to the optional VISCO RM software. TEMPERATURE: The RM 100 TOUCH GEL TIMER has a PT100 sensor which indicates temperatures between -50 °C to + 300 °C. VISCOSITY RANGE: 100 - 5,000,000,000 mPa·s depending on the speed used. BENEFITS FOR YOU: Take advantage of the external control of your RM 100 TOUCH GEL TIMER thanks to the VISCO RM software INCLUDED Use of disposable cups. TEMPERATURE: Cone Plate stand CP2000: 5 to 80 °C through Peltier effect Cone Plate stand CP2000H: room temperature to 300 °C through electric heating. VISCOSITY RANGE: 5 - 8,000,000 mPa·s depending on the cone used. BENEFITS FOR YOU: Measure viscosity with a sample of less than 1ml. Quick warming and cleaning. Save your measurement protocols directly on your viscometer. The RM 100 TOUCH lets you set measuring times for thixotropic products. You can connect a USB printer. External control thanks to the optional VISCO RM software. 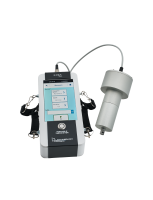 The RM 100 i TOUCH guarantees industrial measurements identical to in a laboratory in immersion tanks . The RM 100 L TOUCH can be installed directly on your production lines; its magnetic coupling principle provides the perfect seal .